Are you starting to feel as though you are stagnating in your career? 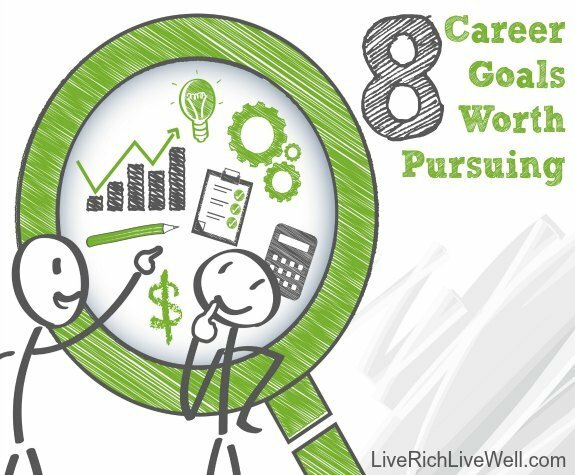 Perhaps you need new career goals to keep you engaged with your present… and your future. Setting goals can help you strive for more, and can help you map out a more complete career strategy. Develop your communication skills: You might be surprised to find that good communication skills are essential for career success. Develop your ability to communicate verbally and in writing. Brush up on your presentation skills. If you want to make a good impression, learn how to communicate effectively. Establish your personal brand: Anymore, everyone needs a personal brand. You can build your personal brand with the help of social media (especially LinkedIn), and by establishing your reputation for excellence. Because you are likely to change jobs over your lifetime, you need to have a personal brand for the benefit of your career. Earn a degree: Find out if you need a degree to take your career to the next level. While you might not always need a new degree to move up in your career, you might. Do a little research, and see if it makes sense for you to earn a degree. Get a certification: Maybe you don’t need a new degree to reach your career goals, but you might need a specific certification. Find out if a special certification can get you a pay raise, or a promotion. Boost your performance metrics: Can you quantify your work contributions? Look for ways to boost your performance metrics. Whether you need to get more sales, save the company money, or complete a particular project, keep track of what you do to excel at your job. If you can make a goal to improve — especially when it comes to the things you can quantify — you are likely to see good results in your career. Network: One of the best career goals you can have is to network more. Learn how to effectively network in a number of different situations. In many cases, your long-term career success is about who you know. Develop relationships with coworkers, colleagues in other companies, and more people, and you can get the inside track on new job openings and more. Get involved with mentoring: You might be surprised about what you can learn if you can get a mentor. Look for a mentor to help you learn how to set and reach your career goals. It’s also worth it to become a mentor if you have achieved a level of success. Pay it forward as a mentor, and you could reap the benefits later. Learn new skills and expertise: Keep learning. Make it a point to learn new skills and develop new expertise. If there is something you aren’t very good at, practice it and improve. Make it a point to learn more about your job, your industry, and other important items. As long as you keep on learning, you are likely to come up with something worth knowing. Once you have a little direction with your career goals, you will have a roadmap that can help you achieve long-term success, no matter what you decide to do with your job. Create something to work for, and you will be more satisfied with your job — and you’ll be more likely to advance in your career.